Dining Room Makeover: Full Reveal! This room has been a long time in the making. I started in July and am just now, eight months later, feeling ready to call it. Old Allison would have started this in July, finished in July, and been changing things by August because she realized she hated it. I am by nature an incredibly impatient person, and that has come back to bite me in my flat, pancake rump many times throughout the course of updating our house. Design remorse is the worst remorse (aside from “cringe-y things I did while I was drunk” remorse) and I am finally starting to see the light. A room doesn’t need to/shouldn’t be done in a weekend. I took my time with our dining room, only chose things I loved, had a clear vision of what I wanted, and now it’s finished, perfect, and my favorite room in the house! Man alive, that hurts my eyes! The first major change was de-orange-ing the floors, and it was definitely a terrifying project. They were in excellent condition, and I could potentially have caused thousands of dollars worth of damage to our house for no good reason other than I didn’t like them. In the end, I was willing to risk it because I hated them so. Damn. Hard. It was a lot of work but it paid off in spades! I didn’t ruin them, they looked beautiful (IMO) and everything is a-OK. Nothing some freshly painted walls, updated light fixture, a new table and chairs, lotsa plants, some fun artwork, black shiplap and a ballin’ new rug couldn’t fix! Damnnnnn…those gross beige walls had to go. I hated them. They were almost bordering on peige (that is my word for pink-beige) and it was not cute. I painted three of the walls a nice crisp white, and did a black accent wall using plywood on the fourth. I also took down that haggard chandelier the first chance I got. The black “ship lap” wall was inspired by Mandi at Vintage Revivals and turned out to be a happy surprise. I found myself wanting to keep it as clean as possible, with the exception of this amazing print I got from Society6 and framed myself in an $11 thrift store find from RE. The photo ledge I DIYed was a nice addition to a boring blank wall, and I love the assortment of prints in all their mismatched, thrifted frames. It was such an easy project, and I am really happy with how nicely it fills up the space. How amazing is that leopard print by Balazs Solti? It is even more fantastic in person. The hutch I flipped is the perfect solution for some storage, and another convenient landing spot for my precious, precious plants. As much as I hate painting furniture, this was totally worth it and a good investment of my time. I almost put it out on clean up day, but decided to give it a second lease on life and it totally ended up working in the space! Can we talk about this rug for a minute? 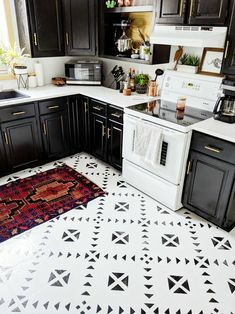 More than anything, I would love a vintage Persian rug like you wouldn’t believe, but sometimes, the practical side of my brain actually wins. It’s tough to justify spending a small fortune on a rug that is going to be absolutely trashed by your dogs’ nails, fur, and vomit. Honestly, EVERY TIME those little shitbirds have to puke, they go straight for a carpeted area. Why do they gotta do me dirty like that? Why, why, why? Someday I will have my dream rug, but until then, this beaut from Wayfair will do quite nicely. It’s the Kowloon Red area rug by World Menegerie, and I had it in my “cart” for three months before I finally pulled the trigger. I’m so glad I did, because it’s exactly what the room needed and the perfect ruby/wine color. It is even prettier in person and gives me the Persian look I wanted at a fraction of the cost. It’s easy to clean and I am not at all worried about it getting ruined. I already spilled Kraft Dinner all over it and it wiped up like a dream. I put a lot of butter in my KD, for reference. It was real greasy. The change is crazy, folks. It feels so good to have this finished. I am dying to start the kitchen but Matt is throwing up picks left and right. The nicer the rest of the house becomes, the uglier that kitchen seems to get. I can’t take much more of it…my goal is to wear him down by the end of April. I think it’s nice to have goals. Welp, that’s a wrap! Are you down with this makeover? Hit me up in the comments! So gorgeous Al! Definitely an improvement!! That’s a real transformation! The plants give life to the room. I think it would be complete with a classy shelf to house an assortment of fine boxed wines. Perhaps a bar cart to house all our Franzia? Excellent job Allison. It amazes me every time I see it. Wow, wow, wow….what a transformation. Every step just added to the process. I can’t imagine what it is like to be able to look at a room and see the end result. It is truly a gift. Feels so light and airy. Can’t wait to see what you do to the kitchen!!!!! Thanks Carmie! 🙂 I might circulate a petition to start the kitchen so Matt will stop giving me a hard time. I hope I can count on your signature. OMG I love reading the stuff you write even more than looking at the stuff you do!! You are a stitch! I love 99% of the redo, not so much the red rug tho. Hey, I’m old and lost the lust for bright colors I guess. I like bright, but along the white kinda bright and monochrome kinda deal. I still think you are just awesome and so very creative and wonderfully talented. And a stitch!! Can’t wait for the next foray!!! I shall sign your petition! Awesome Allison! You have such a creative mind and a talent to be able to complete your dreams. Spring will be here really soon and Matt will be thinking of golf, this is the time for the kitchen makeover! Have fun..
Should I start the petition to get you on HGTV yet? Thanks Alicia! It’s SO pretty and I usually hate red! Also it hides dirt really well which is…important haha! Start the petition: I am ready for my close-up. This is my favorite dining room flip so far! I love the black shiplap wall and the variety of framed photos. The space is very well put together. Thanks for sharing. Love, love, love your new dining room! Wow, you are amazing at Renos, Allison! Thanks so much Tana! 🙂 I’m still learning lots but it’s a really fun process for sure.